There’s a lot going on in March! So far it’s been a busy month for us with school and work, and of course we’re looking forward to Spring Break. 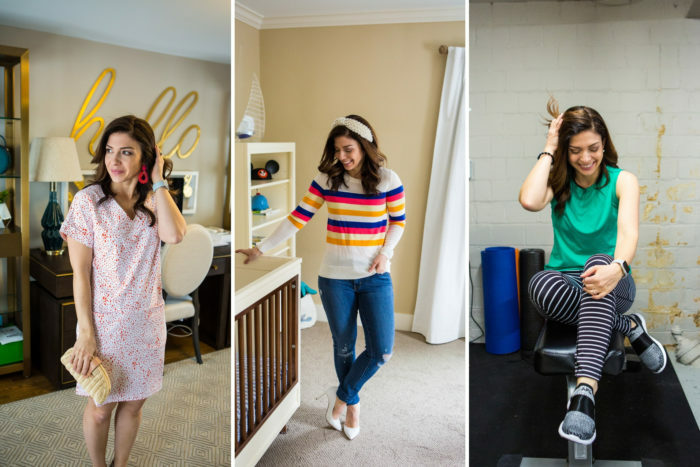 For this month’s outfit ideas, I wanted to do a little variety in outfits for those occasions, and also give you a peek at what my everyday outfits are looking like lately! I got this outfit both for working out and for a “park day” at Disney. Some days I like to be a little more dressed up for the park, but on others I’m all for a good, high-waisted pair of leggings to keep me feeling supported and an easy tank that won’t bunch up when I’m carrying Dylan around all day. These leggings are amazing, they’re seriously supportive and they’re a nice weight. 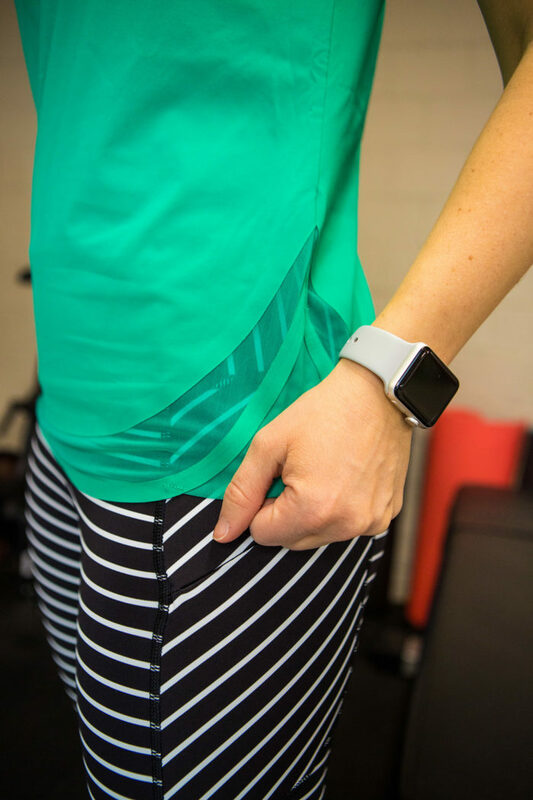 I also love the high waist for both everyday and workouts – I’ve worn them a few times already for Peloton rides! Also, I totally got into the APL craze I’ve been seeing on Instagram and it’s worth it. This is such a comfortable pair of sneakers. I bought some Bombas no-show socks to wear with them. 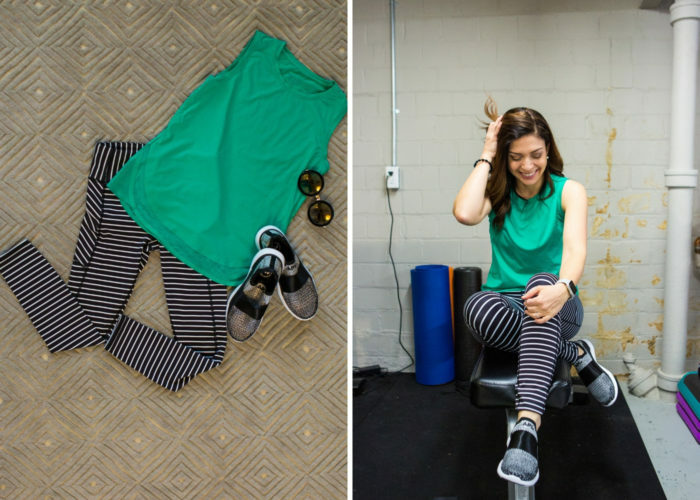 Because of the metallic threads, it was recommended that you wear socks and if you all haven’t tried those socks from Bombas, you have got to do it! They’re amazing. If you haven’t ever tried a dress from Persifor, I very highly recommend you do so for this spring/summer! The patterns and prints are really great and the material is lightweight, cool and comfortable. I think this dress is going to be one of my “park day” options at Disney, as well as a great choice for a casual dinner. 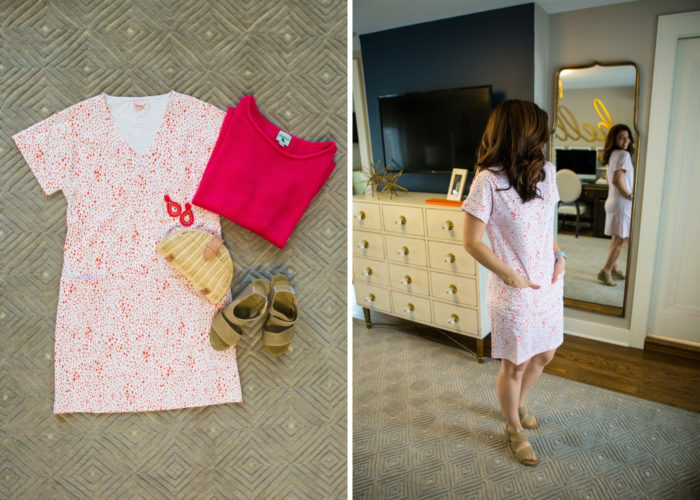 It’s the perfect “throw on and immediately look polished” dress! I also may have to pick up this one for lake weekends in the summer. These Charleston Shoe Co. shoes are coming with me on vacation too. You guys, they are SO comfortable that you wouldn’t believe it. I have a couple other pairs to share with you later but they’re all stretchy and supportive and seriously, the comfort level is amazing. So when it’s spring, but doesn’t exactly feel like it, getting dressed can be a little bit of a challenge. 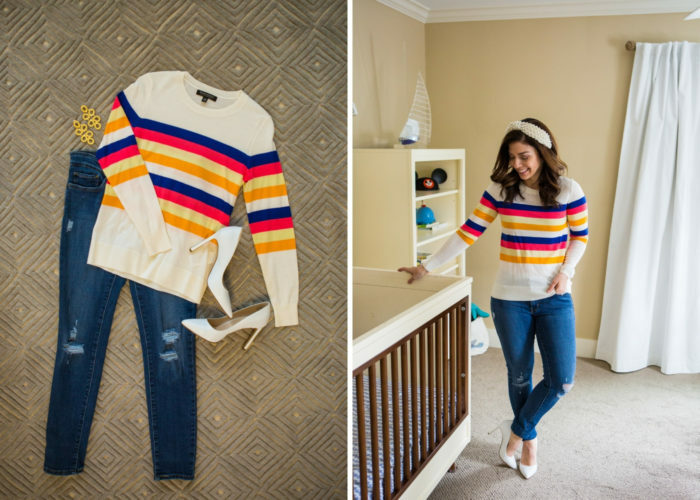 I’m trying to add a little color to my daily wardrobe and this sweater from Banana Republic is one of my favorites (I also got this one because I couldn’t get enough colorful stripes). It’s really soft too, which I wasn’t expecting! I’ve also been a little surprised at how much I love and wear this headband. It’s good for a bad hair day, a good hair day or just when you feel like you need that little something extra with your outfit. It’s still a splurge, but I’d totally buy it at least in one more color (and the lavender is so pretty!) – that’s when you know it’s a good accessory buy!